I looked at this graph and wondered how the trend will continue and about how good retention of new players zero-k has. What are your predictions/judgement of how well did zero-k manage to keep new players? Does the curve has any asymptote, or what kind of curve is it. It would be fun to overlap it with pre-release statistics to see how do they compare :) Whether after stabilisation there will be around 10x as many veterans or 2x or less. I think the best ways to keep player retention is through the creation of reliable tutorials that people have to play before multiplayer(The campaign does fill this role but a lot of people ignore campaigns on RTS's). Its increasingly obvious that a big margin of newer players don't know how to play as a team, or create a stable economy, this obviously leads to them losing a lot and being disheartened by the fact they keep getting killed/yelled at by older players. I personally integrated well into the community, after all, a good inside joke can go a long way. 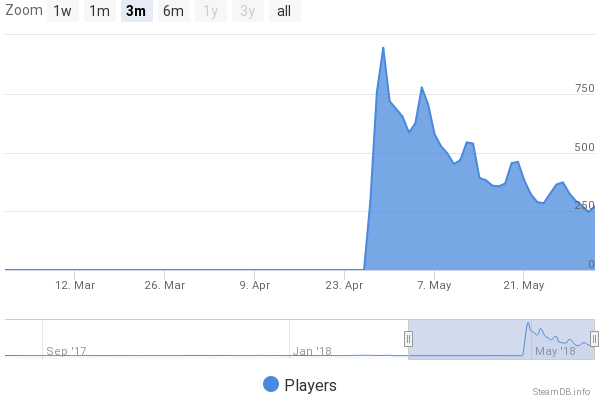 Player base always drops after the initial spike. The trick to retain more players the reaching the possible lower horizontal asymptope of player population is to introduce more player spikes. How to do this? Marketing campaigns bois. But, i'm gonna be real here, who even reads articles on games anymore? You're gonna need some youtuber probably, quite a lot of big RTS youtube channels out there. forcegod: in order to market campaign you need to make it attractive at first: with good story, charismatic characters and fun antagonists to beat. I played starcraft solely for the story of the campaign. I wondered about PW impact on this, but I doubt that event of planet wars will be any attractive to newcomers. It's another complexity in the game that's not anywhere explained properly in already complex game that new players need to learn to get any pleasure from. You may have a point about Planetwars there, also everytime a planetwars round end normal gameplay seem bland and boring in comparsion, but maybe that feeling is mostly for the ones who are actual officers? At any rate many vaguely active players hang around waiting to see what Planetwars is all about, and after the new system is up I suppose rounds can be run semi-often. were they just into single player, finished the campaign and got bored? No game is perfect. What didn't they like? Maybe some of the flaws are reasonably fixable. Personally with the exception of warcrafts hilarious custom maps I never cared about PvP and only ever played campaign and skirmish in RTS games. There should be many many humans like me. Kingstad makes a good point. Even though I've played many RTS games with multiplayer capability, I only became interested in doing multiplayer in like 20% of them. And I play 1v1 all day. Most people don't stick around for multiplayer and this is nobodies fault. Or having a fun and appealing gameplay (not saying ZK doesn't have this. This is a common trait among successful indie titles). Forced tutorials are not fun. If you want fun, put newbies against other absolute newbies based on their prior RTS experience and have that serve as a tutorial. Sort of like a special MM pool. Yes, this is how it's supposed to work in theory, but you occasionally get the weird episodes of top 50 vs absolute newbie and they get crushed and leave because it wasn't enjoyable. You want to keep players around past that? Give em something to do. Have a newbie tournament where no one over 1500 MMR/elo casual or MM can join. Right now you're sitting at a game that has good gameplay, but you don't have a means to flaunt it. Locking it behind a tutorial won't do much to keep players here. Most of the few events we do have are geared towards keeping vets around and interested. A potential idea could be an adopt a newbie tournament where a vet can coach a newbie, but cannot interact with units. Ideally you'd have a signup pool of new players and veterans then have the new players pick their coach. Newbies would ideally be below 1400 elo and have at least 5 or 6 games under their belt. I'd be interested in overseeing this tournament. I wonder how can we let new players know there is such a tournament and how to participate in it. I mean most players may not pay attention to forum/website/community thing/chat. Steam announcement of said tournament would be a great idea. Much wider than these forums. You'd also want to post it on social media and stuff. A newbie tourney would have been a great idea around the time of release,we did have a tourney but it was mostly vets.We should do one though thres plenty of newbies still around who would like to have semi ballanced games. Has anyone asked new players who stopped playing? The lite tourney we had after release wasnt so shabby as there were newbies playing and they could win within their mmr group. The headsup for the event wasnt huge though. I played starcraft solely for the story of the campaign. Same here - though I loathe Starcraft 2 with every fibre of my being for the same reason. But a good narrative campaign is hard to pull off. You need a good story, engaging characters, but also the maps, unit design and mission objectives themselves need to participate. - Many missions have an objective other than "destroy the enemy". Some require to survive a given time. Or to protect a specific unit. Or to destroy a specific unit. Or even to destroy a specific unit with another specific unit type. More than once, new objectives pop mid-mission. And each time, for a good story reason. - The unit design tells something about each faction. The Terran Marine is a dude put into a tin-can and given a rifle cannon with a handle slapped on it. Most high-tech units are on the "slap weapons and some life-support on an engine, then slap armour slabs on it" variety. Those people are ingenious, but they can only afford to build "good enough" stuff, elegance be damned. Contrast the Protoss with their cybernetic and high-tech curves everywhere, even though they avoid unnecessary frills. After all, they can afford lavish factories on their homeworld. - While it's not Stephen Zweig, each character has understandable goals, principles and motivations, and conflicts mostly arise from this. Also good voice actors. - The story itself isn't static, with characters joining or changing sides, and a few hidden agendas. The ending of BroodWar is rather bleak, in fact, with Zerg queen Kerrigan emerging on top of the pileup and still a few bones to pick. More importantly, it avoids the worst clichés in lieu of actual story events. Note that apart from the first point, nearly everything was thoroughly screwed up by the sequel, as well as systematically retconning elements of the story and replacing them with generic, boring awfulness. For possibly the best narrative RTS ever made, check out Homeworld Cataclysm Emergence(1). It is also one of the best narrative zombie games ever made, which is even more surprising as it is a space RTS. The problem is, this above isn't exactly possible for Zero-K. Good professional voice actors are out, the best available staging is a briefing text and maybe some simle in-game camera play (like the intro to the first mission), and we have to work with the unit and map style we already have. Mission objectives and in-mission events are doable, but those require someone to dedicate significant time and efforts on it, so better be as light on those as possible. All comm channels are dead. In fact, more thorough scans and picking up machine data from wreckages reveal a total absence of detectable intelligence. No organics left, no cyborgs, nor uploaded minds or thinking machines. The varied armies seem to all be on autopilot, for who knows how long. The reason for awakening now is probably the massive battle happening outside. - The first mission/tutorial is about powering up a few inactive bots and getting the hell out of here. At least one of the belligerents's IFF seems to recognize the Commander as an ally. - Then, each mission is about searching for clues about what happened, maybe reprogram armies to fend off more hostile ones, and getting new tech along the way. - All of this is described by some text (in addition to the current briefing text) in the description. It may be in italics to denote the Main Character thinking. - Ultimately, something very far away seems to be detected, and one last mission, only available after several end-campaign missions are beaten, is about going there and leaving those mad armies behind. Maybe reaching a stargate. For example : reaching a stargate, capturing it/beat the local force, feeding it enough energy to power it up, fending waves of attack (chickens?) from local forces awakened by the stargate activity, and then walk the Commander into it. - Maybe some final text about leaving this crazy place, and hoping to find something worth on the other side. The main advantage of this kind of story is that there is no other character. No dialogue, or having AI feel like a human (or any sapient being). No spoken text. Minimal descriptions - the story can work entirely on the main character's inner thoughts/notes/journal entries - whatever the narrative text in the mission description is supposed to be. No characterization needed : the good old technique of the hollow protagonist, that the readers/players naturally paint their own projection. Also, it works for everyone. Male, female, baseline, cyborg, gene-enhanced, sapient machine... Any type of character the player identifies with or root for can be the main character. And it is removed enough from the Planetwars story context to avoid incoherences there. Duskers is the best example I can think of of a game using this type of narrative, with similar resources, and a proof that it can work well. This should be doable by slapping narrative texts into the mission description text. If that sounds good, I can even try to whip something up. This would be no Homeworld: Emergence, but it should be enough to keep narrative-minded players like us interested enough in the campaign. What percentage of the player base play a multiplayer game? How many quit after one or a few multiplayer games? I think this is a necessary parameter for the discussion because it will tell us whether people are drawn to the competitive game or they want to play by themselves. If a lot of people are quitting after one or a few multiplayer games, then it's probably getting curbstomped that's upsetting them. I think it was a few days or even a couple of weeks before I started playing other people, but it was always my goal to play against other players and I knew I would take a beating on that road before reaching a place I'm fairly happy with. I think the answers to these questions will focus the discussion on what needs to change. My feeling is matchmaker- even I don't like it if I'm drawn against someone from a higher rating bracket. It took me far longer to work out how to join custom games than the matchmaker queue. Perhaps permanently running custom rooms with settings tweaked in a way that will likely benefit newbies (not sure what this would look like though) and clearly signposted would reduce negative early multiplayer experiences (though newbies can spoil things as much for each other as veterans can for them). Assuming that is the problem of course. On the other hand, games are such a crowded market these days thanks to Steam that getting to blockbuster numbers seems as much a matter of luck as judgement. If someone were interested in using ZK game and setting as a platform for a narrative campaign, i imagine it would not be difficult to distribute it alongside the tech tree unlock campaign. Wesnoth's model where there are multiple campaigns sounds okay.